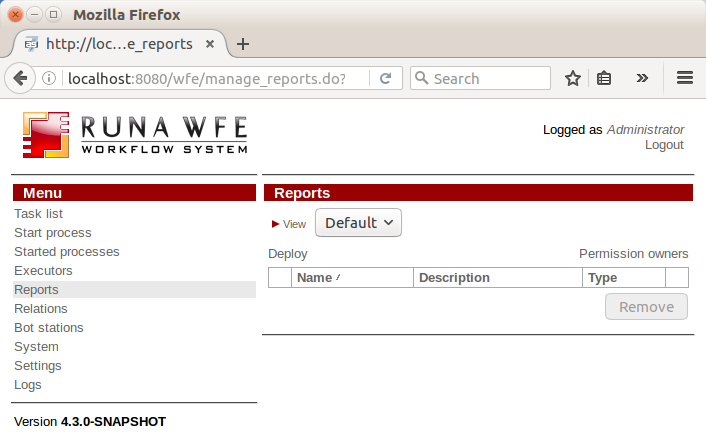 Support of reports based on XML templates - “Jasper Reports” - was added to RunaWFE version 4.3. An XML template can be prepared by means of special programs, for instance Jaspersoft Studio. Open the Reports section by clicking the corresponding link in the menu. The available reports are displayed in the table. When the form appears, enter the report name, description (optional), select a previously compiled report file (with the .jasper extension), create a new report type or select the existing one. If the format of the report is correct, a form will open with the parameters required to build it. Fill in the strings in the “Visible to user name” column for each parameter. Also you can set the positions the parameters are displayed and the parameter’s requirements level. Click “Deploy”, the new report will be included in the list. To change the properties of the existing report use the “Properties” link. In addition to parameters in “Properties” you can also set the permission owners for the report (the “Permission owners” link) – here you can set the rights to read, change permissions, deploy/update/remove. By default all of this is available only for the users included in the Administrators group. 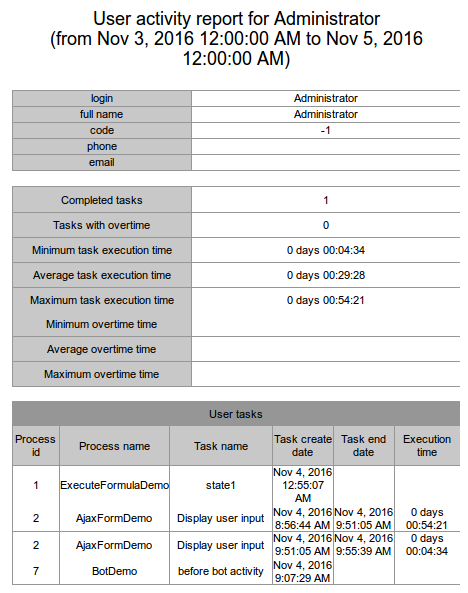 In the distribution package of RunaWFE 4.3 you can find an example of a simple report – userTasks, which generates a document with the statistics of the tasks executed by the user if you execute it. Go to the “Reports” section and click the report name. In the parameter value column you are offered to enter a user login and to set the period to gather statistics on. The generated document can be obtained in one of the following formats: HTML, DOCX, PDF, RTF or EXCEL. Select the needed report type and press “Build”. You will be offered to save the document (the behaviour depends on browser settings). You can see an example of a generated HTML document below. This page was last modified on 5 November 2016, at 17:12.